Daylight Savings Time has kicked in and while I might have missed that extra hour of sleep, I am looking forward to the days of more sun and light ahead! So with that, let’s “spring forward” with spring-inspired office chic… the pink blazer is back! While it’s not a requirement to be in business casual on a daily basis at my current workplace , I still enjoy dressing up and dressing well every so often. 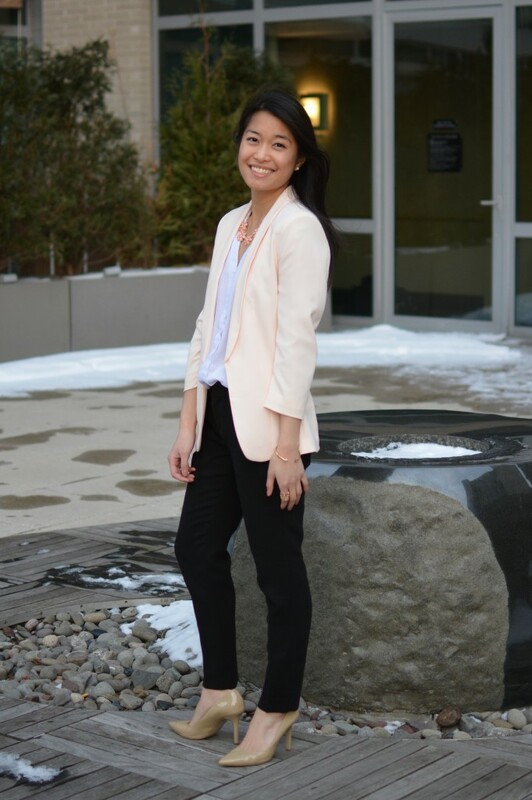 I featured the pink blazer in a more casual fashion last month, and I find satisfaction in knowing that I can easily throw it on for a clean, dressed-up or dressed-down look. This necklace was a recent and very fun aquisition; the ceramic peachy-pink daisies partner perfectly with the blazer and serves to enhance the pinkish color further. The white blouse provides a great contrast against for the creamy palate as well. These cropped black slacks are my go-to business pant. It features a looser leg throughout and a great frontal crease that screams “professional”! And when paired with the cream-colored Nine West Martina pump, this spring-time office look is complete. Thanks for stopping by, and visit back soon for more March-inspired posts. Isn’t pi-day coming up? !